Coconut oil probably takes top spot as the most used soap making oil and for good reason. Not only does it produce a rock hard soap with a fantastic lather but this oil is wonderfully moisturising and adds a barrier to the skin protecting it from the elements. 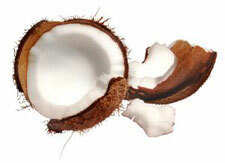 Common Extraction Method: Cold pressed from the fruit meat of the coconut palm seeds. Physical Description: Comes in two forms, Virgin oil and RBD (Refined, Bleached and Deodorized). Both of these oils are solid at room temperature, white in colour and melt on contact with your skin. Some lye calculators list the oil with two melting points, 76 degrees and 92 degrees. You can use either to calculate your recipe since both have the same SAP values. The solid oil is somewhat greasy if applied to the skin but will absorb nicely, leaving a protective barrier on the skin. This oil also comes in a liquid form called fractionated coconut oil. It too can be used in soap making but be aware that it does have a very different SAP value and cannot just be replaced in a recipe. This variety is often used by massage therapists because it doesn't clog pores and absorbs very readily into the skin. Aromatic Description: The refined and fractionated versions have very little scent since it has been pretty much removed from the oil. The virgin oil is a different story, it has a wonderful coconut odour. Soap Making Characteristics: The addition of this oil to any recipe will produce a very hard bar that has lovely large, frothy bubbles. It saponifies very easily and has a strong cleansing ability. Usage in a recipe is usually up to 30%. Anything over that amount can be drying unless you also increase the super-fat amount. Salt soap bars are extremely high in coconut oil but they also have about a 20% super-fat which counteracts any drying effects. Cautions: Can be sensitising in some individuals. Recipe Suggestions: Many recipes on my site contain this oil. Visit the Soap Recipes and the Palm Free Soap Recipes pages for some ideas. Fatty Acid Content: The chart below shows the approximate percentages of fatty acids present in this oil.